So https://eclipse.org/ldt/ (the new Eclipse LDT, successor to Koneki) seems to be pretty solid these days. I've started writing an Execution Environment (like IntelliJ's concept of an SDK) for LÖVE based on the previous Koneki work and a homegrown converter from the love-api table to LDT-format LuaDoc. The easiest way to install this is to grab & install Eclipse LDT, then follow the instructions for a pre-built Execution Environment at https://github.com/leafi/love-eclipse-ldt#pre-built. If you want to build a new version from the latest love-api tables, there's instructions for that, too. It should be pretty straight-forward. Shout at me if you have any trouble. Enums are referenced, but not defined. You'll see an autocomplete popup telling you about window#FullscreenType, but not what the valid values are. 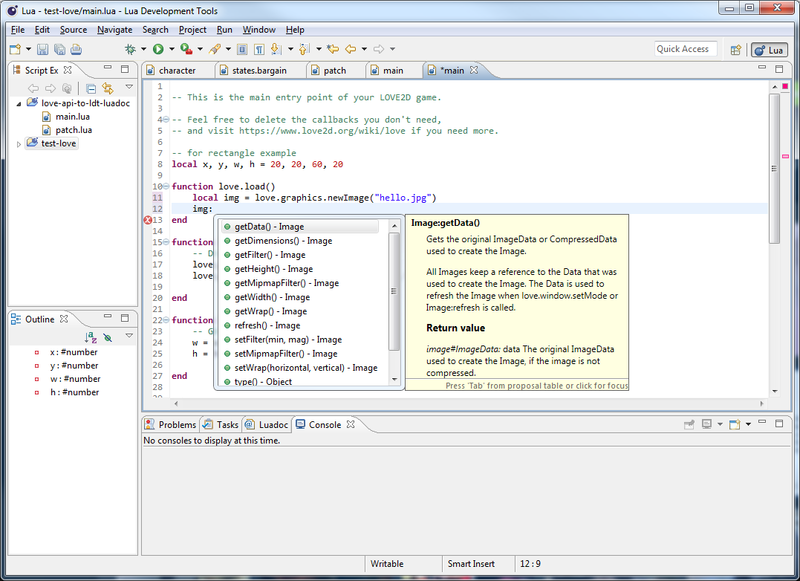 I don't know how to encode enums in LDT format LuaDoc. All overloaded functions only have the first definition emitted. (First in lua-api order, not wiki order.) I can't find a way to represent function overloading in LDT LuaDoc. A particularly egregious example right now is the definition you're shown for love.graphics.newImage() implies the 'format' parameter is necessary. You'll need to set up the Eclipse Run Configurations yourself. Click the little down arrow next to the Run button, and edit Run Configurations... Slightly annoying, but not a deal breaker. utf8 Lua module autocomplete missing. For the non-LÖVE stuff, I'm literally shipping the LuaDoc files from https://github.com/RamiLego4Game/LOVELuaDoc-0.9.0, and it doesn't have that. Probably more I just haven't found yet. Report them! Original Koneki (pre-LDT) API files https://github.com/mkosler/LOVELuaDoc were used as reference material, and the non-LOVE parts have been stolen wholesale. https://github.com/rm-code/love-api/ is the definition set used by the generator to produce the necessary LOVE API LuaDoc. All code I wrote is licensed under zlib/libpng/MIT/BSD (your choice). I don't know what the license of the original LOVELuaDoc is. Suggestions, complaints, bug reports, forks, witticisms welcome. Thanks to @sirskunkalot, updated for LÖVE 0.10.1. I've been busy lately (new job.. woo! ), and the project I'm spending all my free time on isn't LÖVE so I'm still currently absent from the project. Any ideas about keeping it maintained til I'm back are welcome. leafi granted me access to love-eclipse-ldt, but not to love-api-to-ldt-luadoc, so the change in the code is not yet commited to the official repo (but can be grabbed from my fork). sorry for digging up an old thread, but that this work ? I tried latests files to complete setup, all is fine, Love.exe is being run from IDE but no game is being loaded. Where and what kind of argument must be set to actually run love engine plus project itself ? just for the record: I've released a ready-to-go EE for 0.10.2.